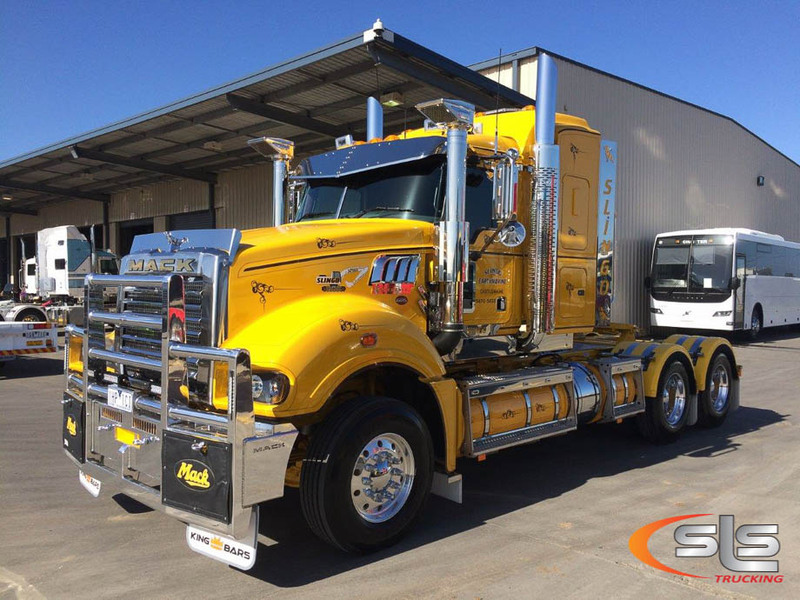 Check out Slingo Earthmoving’s new Mack Superliner with 40″ Midrise sleeper. This truck was delivered by Darren Aitken at CMV’s Laverton North branch. SLS supplied the stainless which was fitted in Melbourne by Shaun Orchy. There was a second matching truck, a Mack Trident daycab. Some of the items SLS supplied were: quarter guard mudflap brackets, lighted pre-cleaner covers, bug deflector, 14″ drop visor, easy fit mirror trims, under door cab scuffs with “Slingo” lettering, windscreen strips, custom wing nameplates, cab door handle & peeper window dress trims, lighted and plain tank trims along with wiring harnesses. Both trucks came up a treat & are a real credit to Slingo & everyone involved.